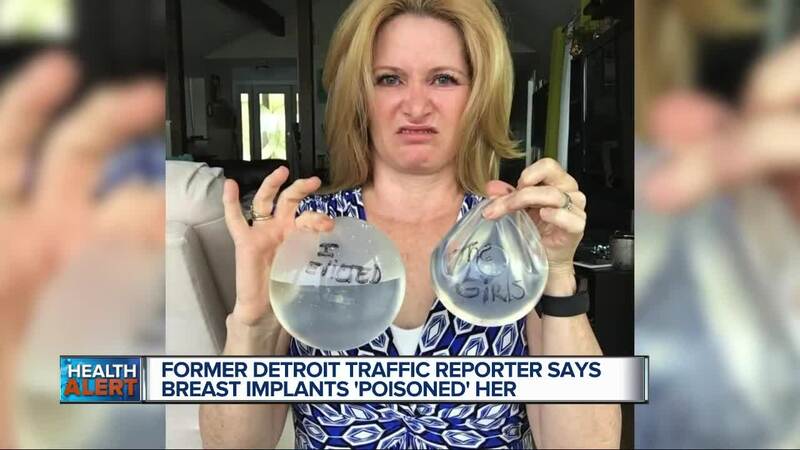 (WXYZ) — The safety of breast implants is back in the news, and a group of 40 women, including a former Detroit TV traffic reporter, will be testifying at an FDA hearing in Washington at the end of the month. Each of those woman have horror stories about how breast implants made them ill, and even suicidal, until they were removed. Tracy Gary used to be high up in a chopper doing traffic reports for morning TV and radio in Detroit. The self-described Energizer Bunny used to multi-task with the best of them, but she says that came to a screeching halt when she got breast implants back in 1998. When Gary first started dating her husband more than 20 years ago, she was super skinny, only about 100 pounds. "I just wanted to look proportioned. I looked like a little stick, and I felt like a little boy," she told Carolyn Clifford. When she got the implants, she said she immediately started having problems like weight gain and severe depression. "When you say depression, what kind of thought did you have?" Clifford asked. "Oh, suicidal thoughts all the time, all the time, it got so bad towards the end," Gary replied. Her first set of implants ruptured in 2010 and she had a second set put in with saline, but she said her medical problems only got worse. She said she suffered memory loss, bad reactions to food and medications, and a diagnosis of an auto immune disease. There were many stories linking problems to silicone breast implants, but most doctors insisted saline filled breast implants were safe. "I think I ignored it a lot because mine were saline, mine were safe, they're not safe," she said. A nurse who lives in her neighborhood told her she had similar symptoms all caused by breast implants. It would take six months before Gary would look to different sites like one called, "Healing Breast Implant Illness." "I went to her Facebook page, 29,000 women, all with the same symptoms as mine," she said. She started researching doctors who could remove her implants. Gary decided she would go to Costa Rica to Dr. Victor Urzola Herrera. A lower price and how women looked after the surgery is what lured her there. She went from a double-d to a small-b cup. Once the implants were removed, she said her symptoms of chronic fatigue, depression, memory loss, brain fog, event her auto-immune disease clared up. Now, she and 39 other women are taking their fight to Washington for an FDA hearing on March 25 and March 26. "They have made it impossible to sue, so this hearing is to try and give women the right to sue," she said. Gary said this ordeal robbed her of her career, so now this is a crusade for her to help heal other women.